All the feelings of Spring flood over me as I enjoy the daylight into the evening. The kids grab their scooters and bikes and we roam the neighborhood after dinner, pausing to acknowledge all the signs of growth around us. 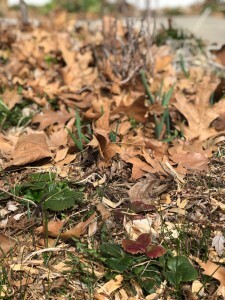 The early Spring bulbs are poking up out of the ground in the neighbor’s yard. The fruit trees are filled with buds in our yard and the little tips of green from the garlic bulbs planted in Fall are making their presence known. Yes, things are starting to come alive and the feeling of Spring engulfs me as I soak up the sunlight streaming through the window onto my face. In the mornings now I slowly sip my coffee waiting for the day to warm up enough to open the windows and let the fresh air fill the house. The change in season always gives me a feeling of excitement and Spring ignites my feeling for new, for growth, for adventure. It is time to clean, to purge, to dust the cobwebs out of the darkened corners of Winter and dive into projects put on hold. My ferments call for attention as I come back to a more consistent routine of Kombucha, Water Kefir and Milk Kefir. They keep me company during the Winter months but my desire to keep a more diverse rotation ignites as Spring fills the air. I start to dream of other fermentation ideas as more and more fresh produce becomes available. My dreaming results in lists of to do’s: fermented Spring carrots, fermented garlic-scapes and fresh nettle cake. Sunday is spent cooking breakfast, prepping dinner and feeding ferments. For my house, my water kefir and milk kefir are switched over and fed fresh ingredients every 1-2 days. The Kombucha is a longer ferment. In our home, the first ferment sits 1-2 weeks depending upon how cold I keep the house and once I have bottled up a batch, my bottles will sit with tasty flavors of the season until complete with beautiful carbonation in 3-5 days. Fermenting requires a person to get to know their own micro climate. What temperature do you keep your home? Does the temperature vary in the area where you will store your ferments? I love fermented food and try to eat at least a couple servings a day. My family on the other hand is very particular about their fermented food. I try to incorporate ferments into our meals in different ways so that they get a few servings each day. They do love their Water Kefir and will drink that regularly so I make sure to have that on hand at all times. The kids love a glass in the morning or right before bed after a long day of playing. The cool, light flavor is a great thirst quencher after an afternoon in the sun, too. I enjoy a fizzy glass of kombucha most afternoons. The tangy flavor is a great compliment to the sunny day and offers a refreshing pick me up. I experiment with the flavors, often incorporating what is in season. Each batch has its own unique flavor but each bottle offers the same refreshing crisp taste that compliments the warmer months of the year. Spring food is light and refreshing. The season allows for tables to be filled with cold salads, simple side dishes and yummy fresh herbed dressings and dips. As we transition out of the colder weather my fermentation efforts are a great complement to the fresh dishes that fill our table. Big bowls of salads are filled and topped with salad dressing made with kombucha or water kefir. We invite friends to come over and share in the celebration of the change of season. We lift our glasses filled with fizzy kombucha in cheers welcoming the new and the growth to come. 1 cup dry quinoa (soaked rinsed, cooked and cooled. 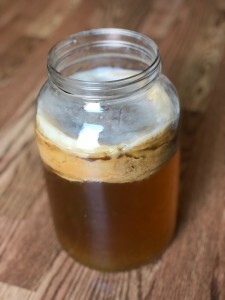 1⁄3 cup Kombucha home brewed or bought from the grocery store. Original flavor recommended. I recommend soaking your quinoa for optimal digestion benefits but soaking is not necessary. If you choose to soak: add 1 cup dry quinoa to a bowl with 1 Tablespoon apple cider vinegar. Allow to soak a minimum of 6 hours or overnight. Once you have soaked the quinoa, rinse until the water runs clear and put in a pot to cook. Add two cups water to the 1 cup quinoa. Bring to a boil. Once boiling reduce to a medium/low simmer and cook for 15-20 minutes. Turn off the burner and allow to rest for 5 minutes. Remove from pot and allow to cool. In the meantime, add 1 Tablespoon olive oil to a warm skillet. Chop the onion and add to the skillet to cook for 2-3 minutes. Mince the garlic and add to the onion. Stir occasionally. Cook until onions start to brown. Combine quinoa with the onion and garlic in a large bowl. Chop grapefruit into 1 inch chunks and add to the bowl. Add sea salt, honey, chopped cilantro and kombucha. Allow to chill in the fridge to allow the flavors to marinate for at least two hours it will be even better if you allow to marinate in the fridge overnight. Optional: add chopped bacon or roasted chickpeas on top when serving.